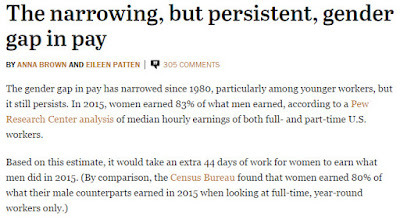 Yesterday was Equal Pay Day. It symbolizes the date when working women’s wages catch up to what men were paid the previous year or how far into 2017 women have to work (on average) to earn what men earned in the 2016 calendar year. Pew Research Center reported that in 2015, women earned 83% of what men earned. So, the gap is narrowing (you've probably seen the often sited 79 cents on the dollar statistic), but still persistent. I've spent a lot of time thinking about pay equity and making sure the compensation program we have at ASHA works equally well for everyone. In 2015, I was asked to help facilitate a workshop at ASAE on Negotiation Success in Your Association Management Career and one of the things that was discussed was how to negotiate a job offer. There are plenty of studies that show women don't negotiate as aggressively and; therefore, wind up with lower starting salaries than men. Salary increases in future years compound the problem. Since women and other people in minority groups tend to be paid less than men, basing an offer upon a candidates salary at a previous job perpetuates past discrimination. Massachusettes decided to deal with this problem by prohibiting employers from inquiring about a candidates salary history during the hiring process. The law is the first of its kind. Addressing this problem one woman and one job offer at a time seems like a highly inefficient way to fix the problem. I think HR professionals need to fix the system--the underlying policies, procedures and practices. It is not the candidates responsibility to tell an employer what a job is worth. HR folks have plenty of survey resources available to determine what other employers pay for similar work. At ASHA, we benchmark (market price) every job based on a carefully written position description and determine a competitive salary. When we post a job, we post a starting salary range that's from 90% to 100% of this number. It's non-negotiable and if you take a look at one of our postings, you'll see we clearly state that along with the FLSA exemption status and other facts about the job. 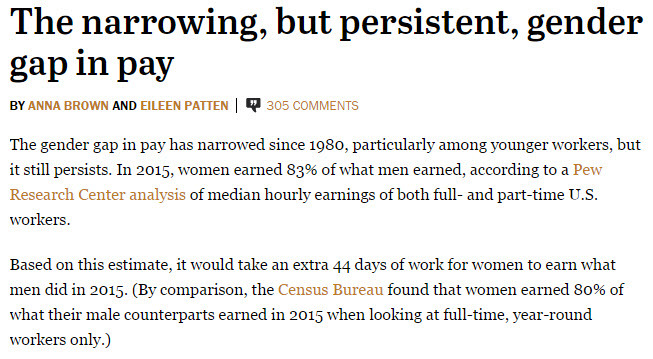 The pressure to eliminate the wage gap is ratcheting up. The Obama administration encouraged companies to sign an "Equal Pay Pledge." If employers don't fix the problem, individual states will continue to create their own pay equity laws like California, New York, Massachusetts and Maryland have. I understand New Jersey, Pennsylvania and Washington D.C. are currently working on revisions to their equal pay statutes. Until recently, state laws typically followed the Federal Equal Pay Act of 1963. These new laws radically alter how pay equity will be determined in these states and will most certainly complicate administration for employers with employees in these states. Before other states take action or employers find themselves facing expensive and time consuming litigation, maybe HR folks should act and find out what's driving pay in their organizations. If you have people working in multiple locations, decide which locations you'll start with. Obviously, you want to prioritize people working in states with pay equity laws like California, New York, Massachusetts and Maryland. Make sure the data you are going to use is clean. If your HRIS has people in the wrong jobs, or inaccurate education information, you're going to be facing the old GIGO (garbage, in garbage out) problem. If you find a problem, dig deeper to see what might be explained by factors you're including in your analysis like education and years of experience. You can do a regression analysis using each of these factors to determine how much of the disparity they explain. Again, if you find a problem, develop a plan to fix it. You may need to modify your compensation program policies, procedures and practices in addition to making market adjustments to the salaries of some people. Consider protecting confidentiality by involving an attorney. If you need a statistician to help with the analysis, you may want to have your attorney hire or contract for those services. I attended a session at a Kilpatrick Townsend seminar last week with attorneys Jim Coil and Flora Manship that was excellent. If you don't know who to call for help, you might want to start with them.